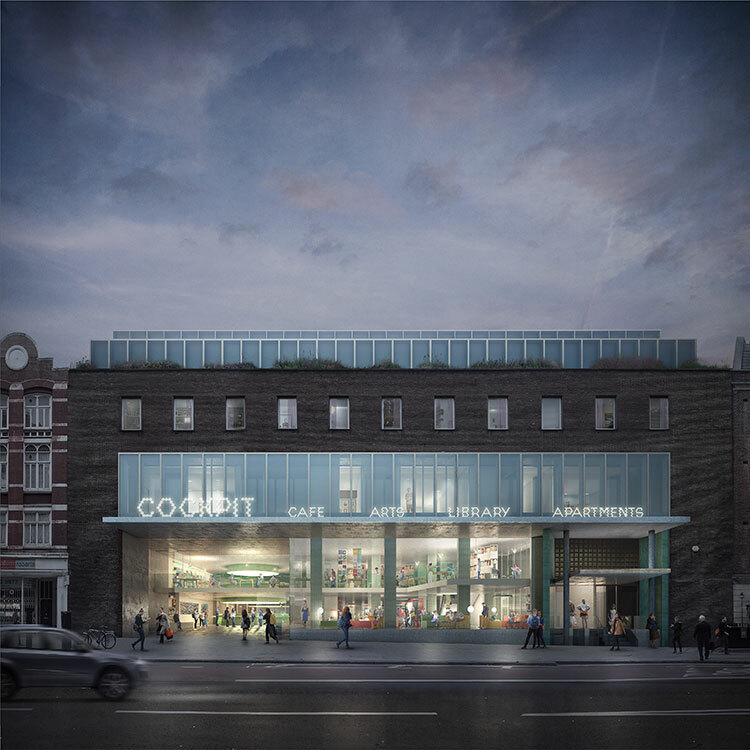 This mixed-use project is to redevelop Holborn Library on Theobald’s Road and the city block behind it in the heart of London’s Bloomsbury Conservation Area. The client has formed a private-public partnership with Camden City Council to unlock the site’s full economic, social and cultural potential. The scheme will fully remodel the library, provide brand new employment studio spaces, deliver 105 new homes, and create new public spaces. Holborn Library, one of the earliest Modernist public library’s in the UK, is inflexible and poorly connected to the surrounding public realm. Although it backs onto Cockpit Lane, a cul-de-sac that accommodates the Cockpit Arts building, there is currently no connection between the two. The brief was sensitively to reinstate this historic route to make the activities within the library more visible and welcoming. 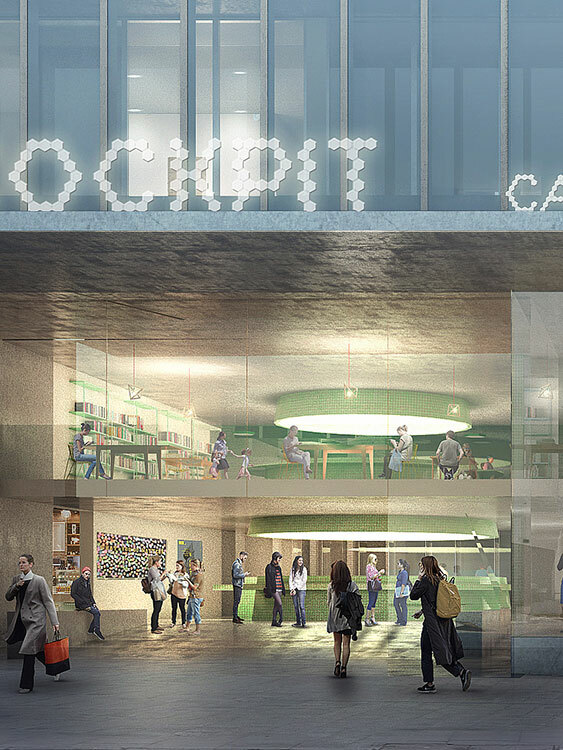 Our design is anchored around Little Cockpit Yard – a conical event and performance space that plays on the hexagonal motif in the library and brings daylight to all floors of the library. A link between Theobald’s Road and Cockpit Lane, it is designed as place to gather, meet, study, read and relax. 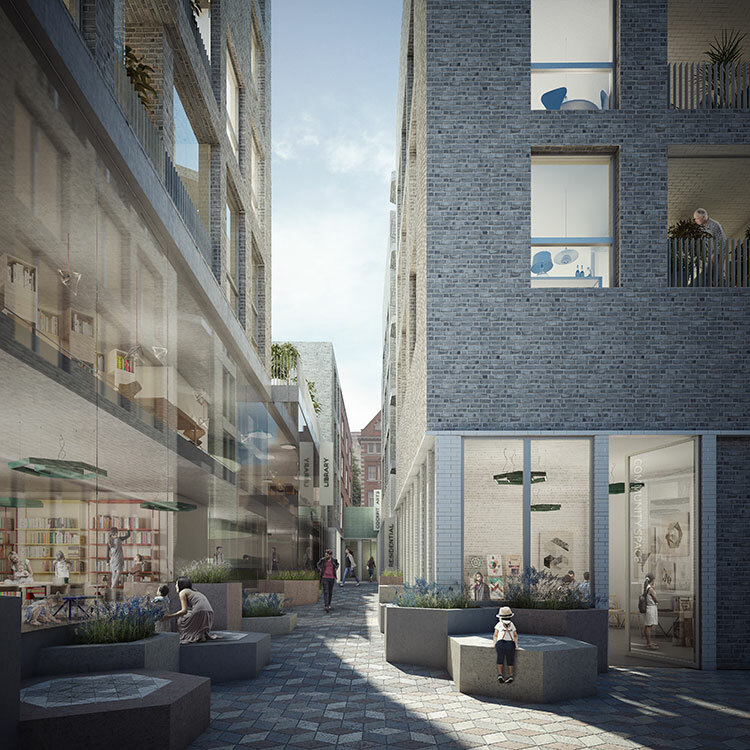 It will regenerate the library as an attractive destination in Holborn, and connect to the wider Holborn hinterland beyond, significantly boosting the public realm. The conical Cockpit form is at the heart of the scheme. It is a meeting point, a gathering place, a place to study, read and relax. 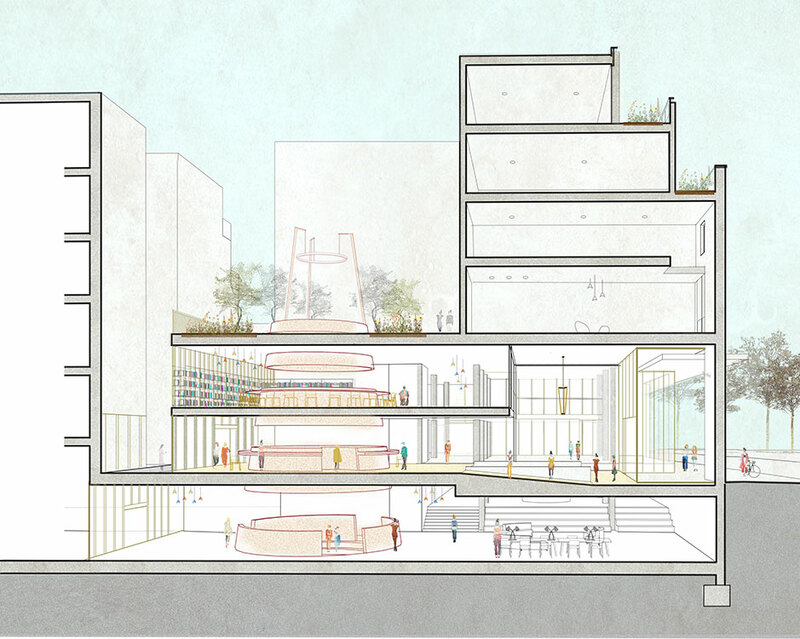 It draws people in from the street and forms a focus of the library and the public spaces. Conceptually, the cone brings together many of the themes in the proposals. The conical form comes from the conical roof of the historic cockfighting arena that gives Cockpit Yard its name, and once again forms a place for people to gather. The location is in the reinstated Little Cockpit Yard which forms a new civic space in the library. 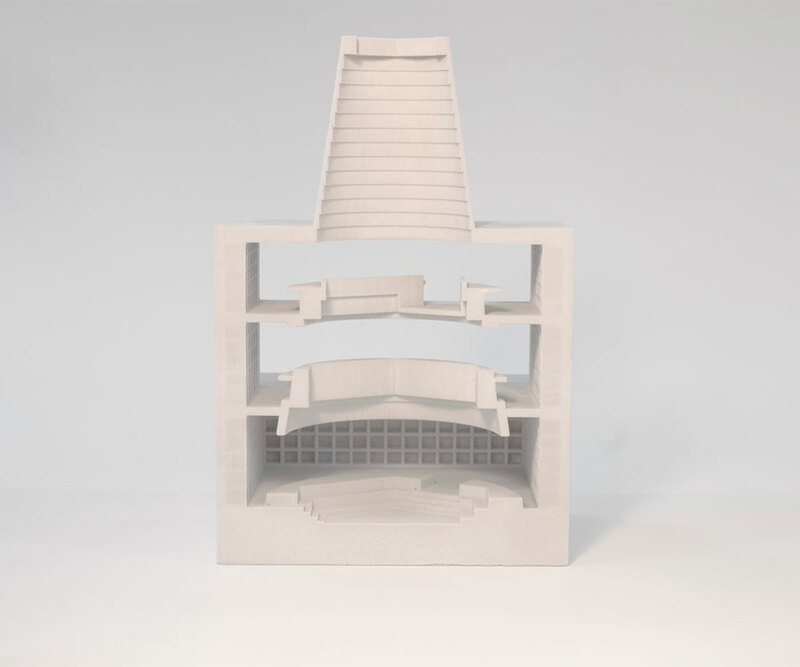 The form inside the cone picks up on the hexagonal geometry of the proposals that spring from the decorative motif in the original library building. The proposals for the Theobald’s Road facade respect the existing library building and its positive contribution to the conservation area, while opening up new views into the library. The life and activity of the library can be seen and views through Little Cockpit Yard to Cockpit Lane behind draw people into the site and give a sense of the varied activity in the site and of the wider Bloomsbury hinterland beyond. The historic route into the site is restored as a public route into and through the library. Anchored around the conical “cockpit” event space, this open, welcoming area attracts people into the library and connects the activity of the site to Theobald’s Road. Cockpit Lane runs from the south end of John’s Mews and links all the uses on the site. It opens to Little Cockpit Yard to the south, and provides a view to Cockpit Arts’ space at its end, with residential accommodation accessed from each side of the lane. Our in-house model making facilities allow us to explore representations of The Cone, playing with shape, layer, light and void. 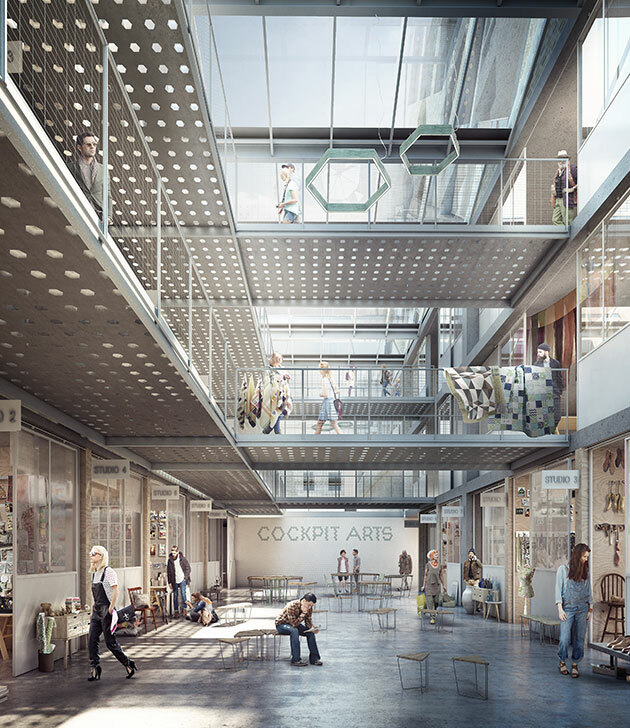 The southern portion of Cockpit Yard is glazed over to form a light-filled atrium, bringing daylight to the studio spaces accessed from balconies spanning the space. Below is a generous area where activities can spill out, where events can take place and where the designer-makers can gather.